results of 44th State Art Exhibition (Artist Category).Accordingly, in the Painting and Graphic Print Section, Hitesh Pankar, Veenita S Chendvankar and Damodar Madgaonkar have been selected for the award. 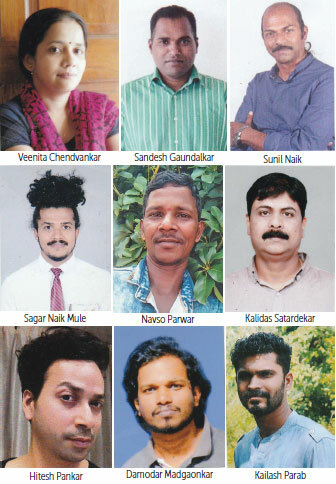 In Applied and Graphic design section, Sunil H Naik, Kalidas K Satardekar and Sandesh Gaundalkar have been selected and in Sculpture section, Sagar Suresh Naik Mule, Kailash Sadashiv Parab and Navso K Parwar has been selected. They will be awarded Rs 20,000 each. Pramod Kamble (Ahmednagar), Gopinath Kukde (Mumbai) and Rajan Fulari (New Delhi) were on the panel of jury for this competitive exhibition. Kala Academy has been organising the State Art Exhibition for the last 43 years.This year, altogether 144 works were received in all the three sections and a total of64 works were selected for display in the exhibition. The exhibition will be inaugurated at the hands ofGovind Gaude, Minister for Art and Culture, Government of Goa and Chairman of Kala Academy on October 31, 2018 at 4:30 pm in the Art Gallery of Kala Academy, which will be followed by prize distribution function at the Black Box of Kala Academy. On this occasion, a lecture on the topic ‘The phrase and the text…some linguistic problems in Modern Indian and Contemporary Art’ aided with a slide show presentation will be delivered by Prof Dr Deepak Kannal, Art Historian from Baroda. This exhibition will be on view for public from November 1 to 4, 2018 between 10am and 7pm.